Tell your mum how much you love her by making her this adorable card - it's simple enough for a child to make too! This super-sweet card is the perfect way to let your mum know you care, she’ll love being given a handmade card rather than a shop-bought one, that a thousand other mums got! If you have brothers and sisters you could make a few extra baby owls to add to the front so you can all give her the card together. Just add them in at the bottom, making them slightly smaller than the original baby one. You can choose the colours to match up with your mum’s favourites, we like sticking to pastel for the background, so it looks spring-like since Mother’s Day is in march. Don’t forget to pick up an envelope too when you’re making your card, you want it to be a lovely surprise for your mum when she opens it. You could even give it to her along with breakfast in bed for extra brownie points. 1. Either using our picture as a guide, or enlarging on a photocopier, trace and cut a large owl shape from purple paper and a small owl shape from pink paper. 2. Cut a large and a small wing from contrasting coloured paper and two beaks from yellow paper. Arrange all the shapes on the front of a pastel-coloured blank card. 3. Once you’re happy with the positioning, glue everything in place with a glue stick. 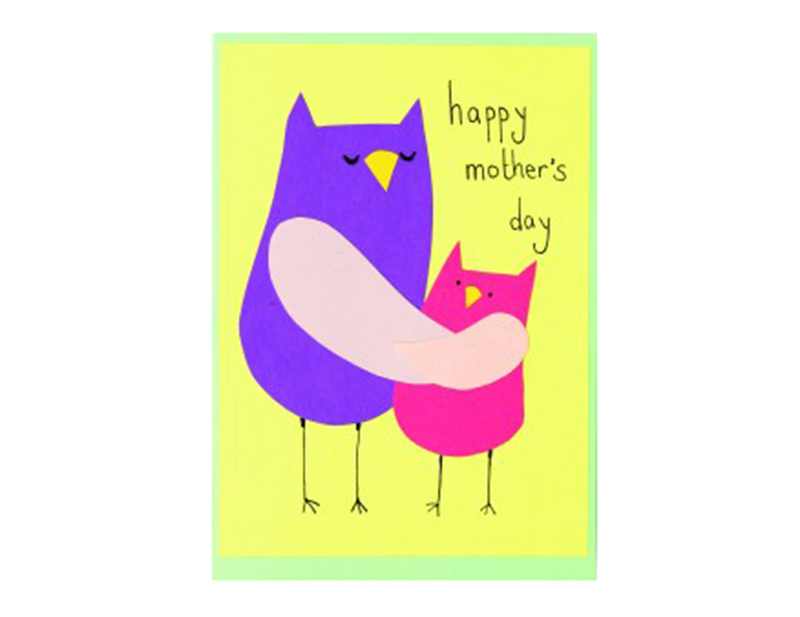 Use a fine black liner pen to draw the eyes and legs, and neatly write ‘Happy Mother’s Day’ above the small owl. Pop into an envelope and stick shut. Write mum on the front and hide it until the big day! She will love it.